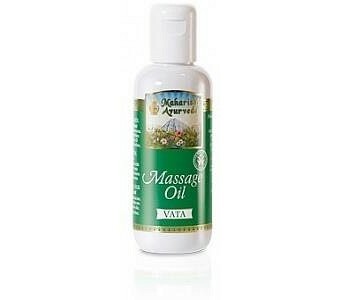 Maharishi Vata massage oil is specially formulated for dry skin. This is an Ayurvedic massage oil, based on ripened, certified organic sesame oil and 100% natural lemongrass aroma oil, with country mallow, winter cherry, aloeweed and mimosa and other Ayurvedic herbs. It revives the senses and helps to reduce Vata. Package size: 250ml Benefits include: Improved circulation Elevated energy levels Muscle toning Balancing effect on the mind and nervous system.